The Frugal Family Life: FREE Juicy Juice With Purchase of 24 Pack Play-Doh! 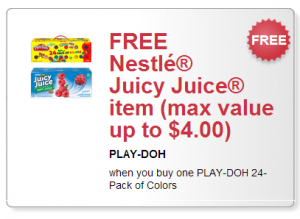 FREE Juicy Juice With Purchase of 24 Pack Play-Doh! Head over to the Play-Doh facebook page to grab a nice coupon for (1) Play-Doh 24pk and get a FREE 64 oz bottle of Juicy Juice (up to $4.00)! I’m not sure how much the 24 pack of Play-Doh runs, but when you factor in the FREE juice up to $4.00 value, I’m thinking it should be a good deal! And the Play-Doh would be great for stocking stuffers or to stash away for a birthday gift!